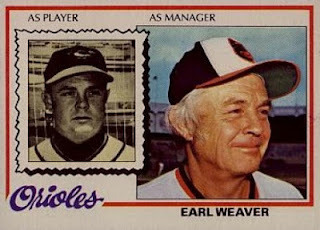 Earl Weaver’s notoriety for his fiery temper long preceded his career as a Hall of Fame manager for the Baltimore Orioles. The 82-year-old Weaver, who passed away passed away early Saturday morning from an apparent heart attack while on a baseball themed cruise, was a fiercely competitive second baseman in the St. Louis Cardinals farm system in the late 1940s and early 1950s. Weaver was signed by his hometown Cardinals out of Beaumont High School in 1948. His first destination was their Class D affiliate in West Frankfort, Illinois. Floyd Melliere, a pitcher who went 21-4 on that team, recalled in a 2008 interview that Weaver’s penchant for baiting umpires started very early in his career. Standing only 5’7”, Weaver drew comparisons to Eddie Stanky, the All-Star second baseman who was revered for squeezing every ounce of his ability out of his slight frame, whether it was by razzing his opponents from all over the field, leaning in to a pitch to get on base, or sacrificing his body to get in front of a hot shot through the infield. Russell Rac, Weaver’s roommate in 1950 at Winston Salem, compared the two in a 2008 phone interview. Weaver was a member of four straight pennant winning teams in their minor league system, and was offered an invite to spring training in 1952 prior to Stanky’s acquisition. He was given a brief trial at major league camp that spring, but didn’t make the cut. Larry Granillo of Baseball Prospectus highlighted one of Weaver’s 1952 spring training games, where he went 2-5 against the New York Yankees while sharing the lineup with Stan Musial, who in a sad twist of fate, passed away the same day as Weaver. Whatever momentum Weaver built within the organization came to a halt with Stanky taking over the reserve infielder spot, as he could not crack the ranks with both Red Schoendienst and Stanky in front of him. Weaver never reached the majors as a player, becoming a manager in the minor leagues in 1956, working his way up the ladder the same way he did as a ballplayer. He took the reins of the Baltimore Orioles from Hank Bauer in 1968 en route to a World Series championship in 1970. Weaver spent 17 seasons at the helm from 1968-1982, and again from 1985-86, compiling a 1480-1060 record with four American League pennants to his credit. He was elected to the Hall of Fame in 1996, and while his intense battles with umpires are etched in the memories of baseball fans everywhere, his spirited displays date back to his travels through the back roads of the Cardinals farm system. Harland Coffman, Weaver’s teammate in Omaha in 1951 captured his nature most succinctly in a 2008 interview.